Pirate Pete entertains kids and adults alike by Telling tales of his travels over sea and land where he has learnt many amazing things. ​He entertains with magic, tales and Pirate tests to see who are potential pirates. 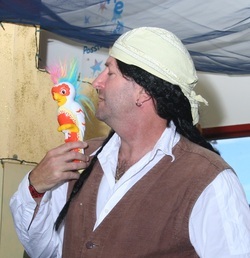 "We were fortunate enough to book Pirate Pete at short notice recently for our 6 year olds birthday party. To set the scene we had 28 children (had only told Pete we had 20 coming) Ages 3 through to 8 years old. I must confess that both my wife and eye have never really seen a great childrens entertainer at other parties we have been to so we were expecting not expecting too much. How absolutely wrong could we be. 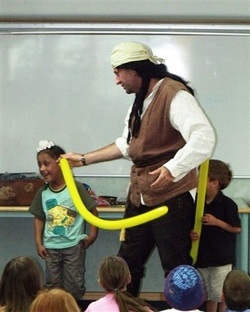 Pirate Pete did an absolutely incredible job, captivating the children's attention entirely for a good hour. Lots of oohs and arrrrrs, laughter, gasping and the occasional scream!!! The adults were also in stiches and Pirate Pete even helped holding the treasure chest pinata still after he had regaled the children with his tails of ship and sea. If you are having a pirate party, I would thoroughly recommend you invite Pirate Pete along. You will not be disappointed. Thanks again Pirate Pete!!"